Cooper Zech got some preseason hype from the WCHA. Now he’s getting some in-season accolades, as well. The preseason rookie of the year was named the WCHA’s rookie of the week today after having a big weekend for his Ferris State Bulldogs. Zech, a South Lyon native, tied for the league’s overall scoring lead with a freshmen-best four points. 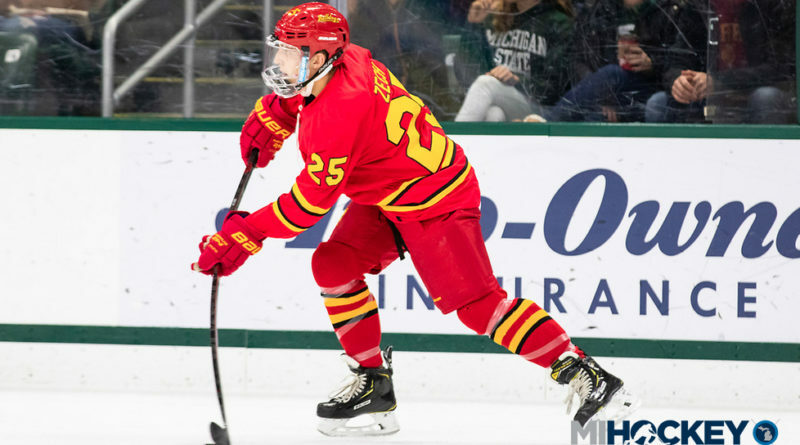 The Victory Honda and Compuware midget alum had a goal and an assist in both of Ferris State’s games against Alaska; his goal on Friday was the game-tying marker that forced OT. The Muskegon Lumberjacks alum posted eight shots on the weekend, and he recorded two block shots with an even plus/minus. On the season, the talented freshman has three goals and eight assists for 11 points in 14 games.